Crazy Rich Asians is now a certifiable box office smash. The all-Asian romantic comedy added even more to its impressive total at the box office over the weekend and it's now cemented itself as the highest-grossing rom-com in nearly a decade. By adding another $4.15 million to its domestic total over the weekend, the critically-heralded movie now sits at $165.6 million domestically. That bests 2009's The Proposal, which starred Sandra Bullock and Ryan Reynolds, earning $164 million during its theatrical run. But the movie's success extends far beyond passing a somewhat forgettable rom-com from nine years ago. Crazy Rich Asians, for starters, is now the second-highest grossing female-fronted romantic comedy at the domestic box office ever, trailing only My Big Fat Greek Wedding, which was an unprecedented monster hit, earning $241.4 million back in 2002, ultimately winding up with $368.7 million worldwide. These types of movies tend to do much better domestically, historically speaking, and looking at the domestic side of things, Crazy Rich Asians is now one of the highest-grossing romantic comedies ever. By overtaking The Proposal, the adaptation of Kevin Kwan's best-selling novel is now sitting at the number six spot all time. Currently, There's Something About Mary sits at number five ($176.4 million), followed by Pretty Woman ($178.4 million), Hitch ($179.4 million), What Women Want ($182.8 million) and the aforementioned box office monster that was My Big Fat Greek Wedding. Looking at those numbers, it seems quite possible that Crazy Rich Asians will find its way into the top five before the end of its domestic run. The number two spot overall isn't out of the question, which would be truly impressive. 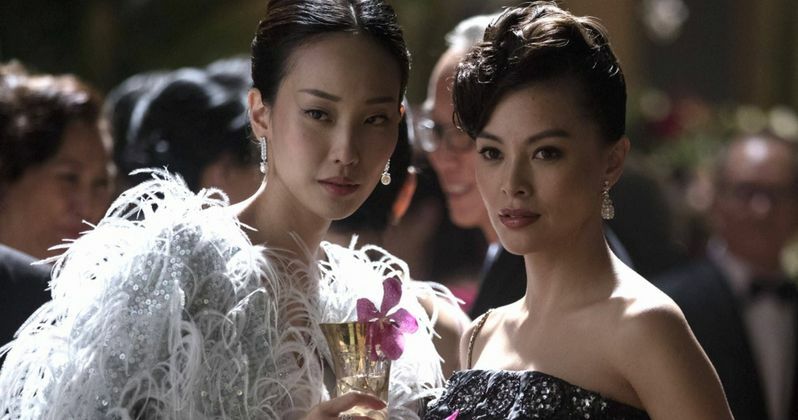 The other element of this movie's success that is well-worth looking into is the fact that no mainstream Hollywood movie has featured an all-Asian cast since The Joy Luck Club in 1993, a full 25 years ago. It was considered a risk, but one that has paid off handsomely for Warner Bros. so far. The adaptation currently sits at $218.8 million worldwide and, while the lion's share will come domestically, it's still got some room to run overseas. One has to think other studios will follow suit, which means we could be looking at a slew of romantic comedies with diverse casts in the coming years, which can only be a good thing. And the Crazy Rich Asians success story is far from over. Warner Bros. is already developing a sequel that will adapt Kevin Kwan's second novel, China Rich Girlfriend, which will see director Jon M. Chu and the central cast return. Given the positive word of mouth with the first movie, if the sequel turns out well, it could wind up being an even bigger hit. Plus, there's a third novel, Rich People Problems, so that Warner Bros. can round out the trilogy and reap the rewards. But ultimately, those who have been clamoring for more diversity in Hollywood will come out on top. These numbers were provided by Box Office Mojo.